Welcome to Saturday! 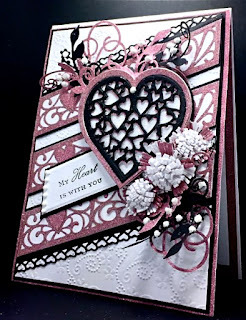 It's my DT day to post for Creative Expressions and I have made another Card using the Hearts of Hearts Die. Also showing 3 additional cards from this past week that I've created using CE's gorgeous Craft Dies by Sue Wilson. 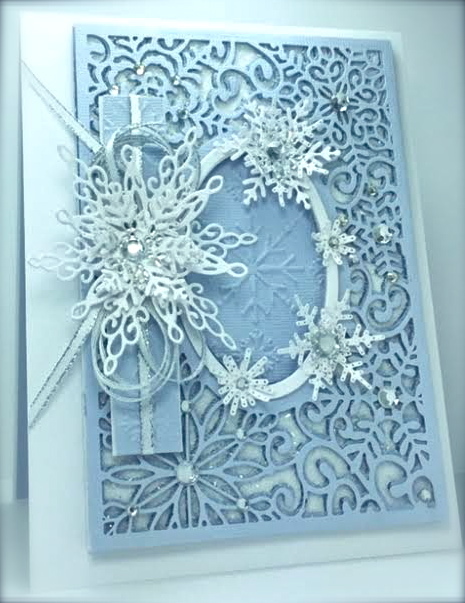 These white flowers were created with the "Foldover Flower Dies" and surrounded by multiple "Finishing Touches" sprays. 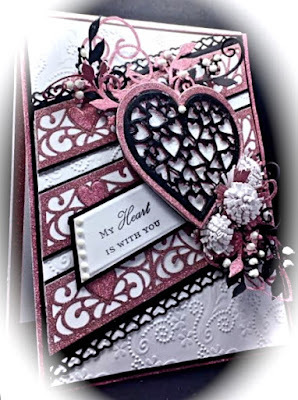 Accessories: CE Sue Wilson Floral Brocade Pinpoint Embossing Folder, CE Craft Dies by SW; Heart of Hearts, Diagonal Collection Love Hearts Dies. Also Fine Granulated Diamond Dust. I've layered the GOLDEN word multiple times (for dimension). Sits on a dry embossed striped panel. The Gemini border was die-cut on both front and back of card base. Extra layers were adhered and staggered for a lacey look on front. A bow and golden pearl button finish the look. 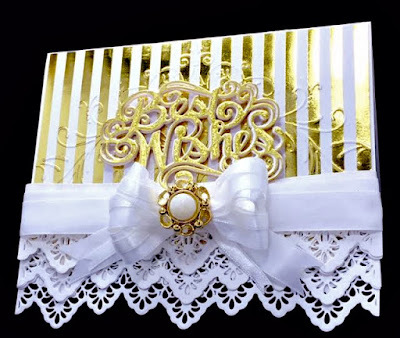 Accessories: CE Craft Dies by SW; Expressions "Best Wishes" Die and The Mini Gemini Corvus Die, Cuttlebug Embossing Folder, Fine Granulated Diamond Dust,Pearl and Golden Button, White Satin Ribbons. (Tip1 - multi-layer your edge borders and stack staggered for a lacey look. Card 2 - Thank You! (Tip 3 - THESE BUCKLES folded and buckled would work great as pretty napkin holders, or for using as handles on Easter baskets, or for creating a scene's fence, or lining up the buckle ends in straight lines for new octagon geometrical looks, or the ends could work as award medallions, or using as fun backgrounds like I did here, etc... Oh boy, to create the possibilities! Hope you'll give these a try! Accessories: Creative Expressions Craft Dies by Sue Wilson; 2015 Festive Collection Snowflakes and Background, Sizzix Embossing Folder, Fine Granulated Diamond Dust and White Marble Coarse Glitter (for texture and sparkle), Dble-Sided Sticky Sheet, Rhinestones and Silver lined white Ribbon. If you are in the USA and you are a Sue Wilson FAN, then check-out this FACEBOOK GROUP for tips, ideas, where to find these CE products, general info and loads of inspiration! Thanks for stopping by today. 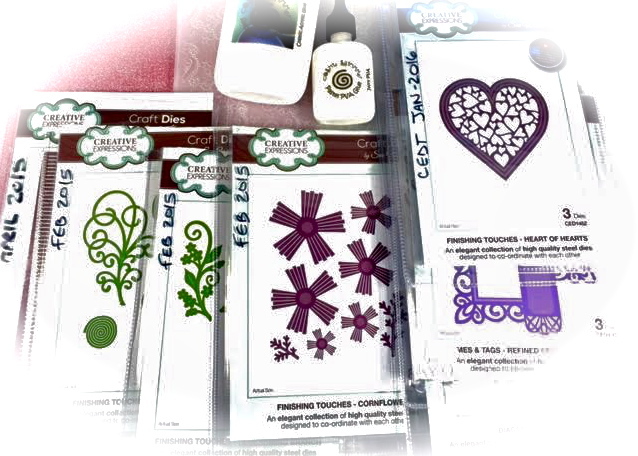 I hope to have inspired you to use these CE products and Sue Wilson Craft Dies! I would really love to hear from you! well they all are gorgeoussssssss and stunning designs America. I love your papers and colour designs. wow teamie you have been busy! Love your DT card - they are all fab. But my absolute fav is snowy day. Your cards are all very beautiful. The heart card is my favorite. What a beautiful project with so many wonderful details! 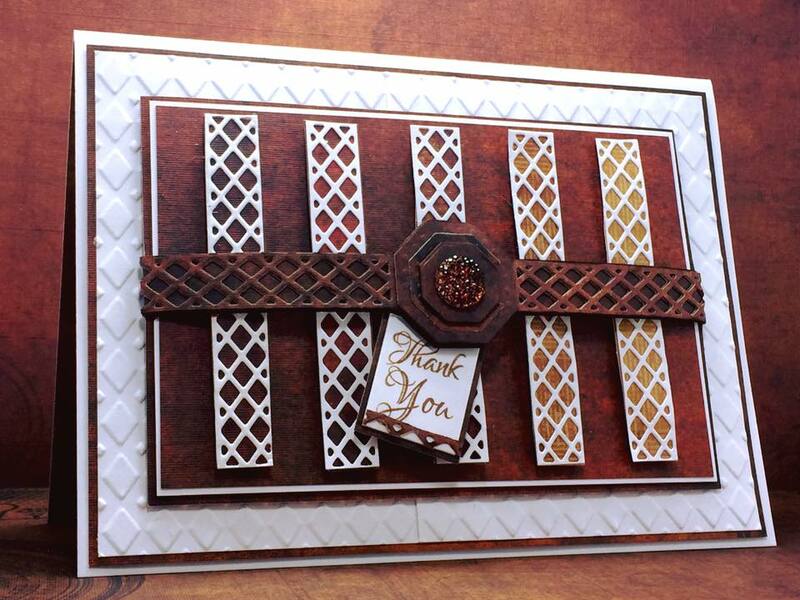 Thanks so much for sharing your talent with us in the Love To Scrap! Challenge Blog's "Anything Goes!" challenge this time! Oh my! Such lovely creations! All of them are just beautiful-I wish I could layer like that! 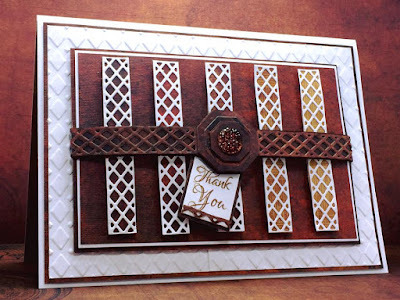 Thanks for joining us at Die Cut Diva's Something New Challenge! Stunning work, each card seems even better than the previous one. Thank you for sharing your work with all of us at Crafty Boots Challenges. What gorgeous cards the heart and the snowy day are my favourites definitely will try to replicate these, thanks for all your wonderful inspiration. This is a stunning collection and how you have showcased Sue's beautiful dies. I especially love the gold one. Thanks for joining in at Crafty Boots Challenges this time. Your cards are fantastic, all quite beautiful. I love the way you used the dies. You are a real cardmaker!! The card are so beutiful and well done !! Really Amazing cardart!! Beautiful Valentine card!! I love your choice of die layout!Thank you for sharing with us at Word Art Wednesday! Your cards are great. Lovely colours and layouts. What a great card set! Gorgeous. I love your color choices and fun layout. Thanks for joining us at Aud Sentiments for our “Anything Goes” Challenge; I hope to see your work in our future challenges too! Really pretty cards! You sure make good use of your Cuttlebug! challenge "fabulous flowers" and ribbon and welcome back!